In our increasingly global world, nationality is closely connected to financial and cultural identity. In China, there has been a rise in young people migrating to America not for professional reasons, but educational ones, with the ages decreasing from university students to high schoolers. Chinese born Miao Wang, director of Beijing Taxi, followed this phenomenon in her new film Maineland. 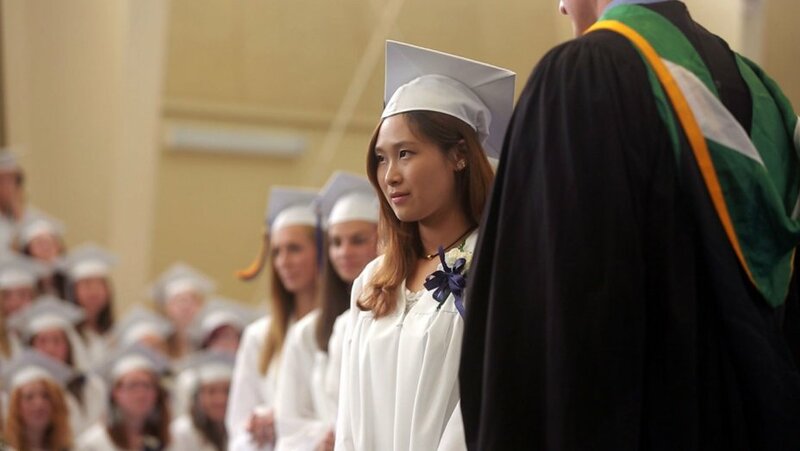 For more than three years, she followed the educational and personal growth of affluent high schoolers who choose to come from China to attend American, private boarding schools, including one in blue-collar Maine. Focusing on students Stella and Harry, the American high school experience is given a new perspective. Lesley Coffin: How did you discover this subject? Were you aware there was a rise in Chinese students coming to America before starting the project? Miao Wang: I guess I kind of discovered the issue the film deals but I also have personal experience. I came to the US as a teenager, actually a little younger at 12. And I experienced the culture shock of going to a school where I didn’t speak the language and it’s hard enough being a teenager, but dealing with all that adds more challenges. But also the fact that the China I left is completely different from the China of today. And now a lot of the students come here from upper middle class families, and that wasn’t the case when I came to America. That’s a development over the past 20 years and I was curious of how it would impact things. Lesley Coffin: You came to America with your parents but most of the teenagers in your film are coming to America on their own specifically to attend schools. Do most of the teenagers plan to stay in America after their graduation or will they return to China? Miao Wang: With most of these students, they intend to at least go to college in the U.S. Most of these parents are actually more concerned with their children attending a college in the U.S. and think coming to the U.S. earlier will give them an advantage. It allows them to adjust to the culture and get used to the educational system. But college is the goal and after that, I think, there isn’t a clear or consistent path, although some parents want their kids to be close or work in their businesses in China. Lesley Coffin: Initially you are following a number of teenagers living in China who are applying to school. But eventually you decided to follow Harry and Stella’s high school experience. What made them stand out of the teens the audience could follow? Miao Wang: From the very beginning, I knew I needed to tell the story from the perspective of a boy and a girl, because gender does impact experiences. And at the very beginning, I recorded all the interviews with the admissions director, about 40 interviews. And I just loved how each of the kids went into that room and tried to present their best faces, but they each did it differently. But I felt right away that Stella stood out because she had that bubbly personality and seemed completely different from the stereotypical quiet Chinese girl. So, I knew right away that she would be one of the main characters. Harry stood out at the beginning too because of the way he talked about his respect for his dad and the reason he wanted to come to America was to learn about critical thinking. I started to follow about five main characters, but as time went by I found a couple of them didn’t really do a lot when they weren’t in class. One of the girls hung out in the dorm sleeping and watching soap operas, so I didn’t feel there was a compelling reason to continue filming her. But also Harry and Stella had two completely different experiences and gave me an opportunity to show different aspects of their lives. Lesley Coffin: Considering how young you were when you came to America, what aspects of their experiences coming to China surprised you. Miao Wang: When I went to school, it was rare for mainland Chinese to go to school in America, even in college and grad school there were only a few. Now just the volume of Chinese students coming to America for school is incredible. Some universities have close to half Chinese students. And there’s a shared experience of alienation and shock when coming to a new place. But I had the support of my parents, and these students tend to build a support network with friends. I was curious how much they would integrate with American students, and from what I saw it was a bit difficult for a lot of them, although it depends on the student’s personality. When I came from China there was a lack of opportunity which is the reason we moved. These students are coming to America but are aware that China has far more professional opportunities and returning with an American education will help them even more if they choose to return. Right now they probably have a better chance to find a good job in China than here. And of course with restrictions on immigration, it’s never been easy to get a work visa but it’s even harder now. I was surprised also to find that these students comes from all over China, so if they hadn’t come to America and formed that small network of fellow Chinese students, they may have never met someone from another part of China, creating an even bigger network within China for them to pull from when they return. Read FF2 Media's review of Maineland HERE.